These become much too bright at night, and can be a serious problem if the device needs to be in a bedroom or hotel room. Which things like laptops, phone and camera chargers and many other devices need to do. I end up putting small pieces of electrical tape over these blue LEDs. I call upon the factories of Shenzen and elsewhere to produce low cost, standardized status LEDs. 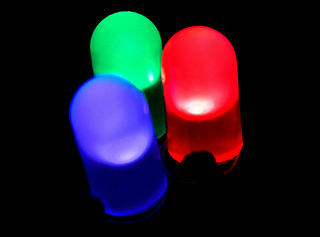 These LEDs will come with an included photosensor that measures the light in the room, and adjusts the LED so that it is just visible at that lighting level. Or possibly turns it off in the dark, because do we really need to know that our charger is on after we've turned off the lights? Get these made and make it standard that all our gear uses them for status LEDs. Frankly, I think it would be a good idea even for consumer goods that don't get into our bedrooms. My TV rooms and computer rooms don't need to look like Christmas scenes. You can probably do this easily enough with a small microcontroller (one of those SOT23-6 chips should work fine) and your choice of LED. PWM to control the brightness, with sensing of ambient light during the "off" part of the PWM. Use of an "off" LED for brightness sensing is pretty well-documented, though I'm not entirely sure that it practically includes the levels of "dark room" vs "somewhat illuminated room at night"
I feel that use of a full microcontroller is the wrong path here. The circuitry needed to do this is super simple, you would barely even call it an IC, and indeed, it has to not add much cost on top of the LED. Apparently you can even use the LED as a photodiode when its off, or have your own phototransistor which would then drive the timer in your PWM. But it's just a couple of parts, and the idea is to promote the function as important so they get made in the hundreds of millions and don't cost much more than the bare LED. Maybe you could get Adafruit to stock a version? Get the idea into heads of next-generation of designers. I wonder if the reason they're so bright is that products are competing for attention on the shelf - brightest LED in a brightly lit Best Buy wins. They are never seen in the dark before purchase. Same as how all the TVs on display have brightness & color saturation turned up way too much.